The Nokia 5800 XpressMusic, or Tube as its also known, has been the subject of further leaks following its movie debut in The Dark Knight. Originally code-named the Tube, the Nokia 5800 XpressMusic touch-screen midrange smartphone has officially started shipping to select countries, according to a Nokia press release. It’s part of the XpressMusic line, which generally means a lot of music-oriented features and plastic, but in all honesty the device is one of the few affordable touch-screen phones out there. Its fleeting part in the movie did little except confirm the Tube is a nice looking handset; however these new details spoil us with information. 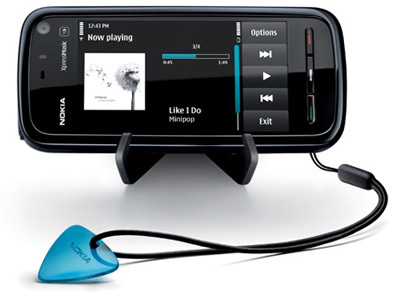 Here’s the latest on Nokia’s Tube The Nokia 5800 XpressMusic. Being an XpressMusic handset the Tube should have great audio capabilities, which can be enjoyed through your own headphones thanks to the 3.5mm jack plug. Video should be good too as a TV-out socket is provided. An internal memory of 140MB is larger than many these days, but of course you can store all your media on a MicroSD card up to 8GB in size. It’s not going to be a bulky thing either, with its 14.5mm thickness and 104 gram weight. It's S60, so if you were hoping for something else you'll be sorely disappointed. Nokia's done "just enough" to turn the traditional interface into a touchable one with version 5.0, sizing up icons, adding finger-friendly buttons in lieu of traditional menu items and so forth. What Nokia hasn't quite figured out is consistency, requiring double taps in some places, single taps in others. Scrolling through most lists requires dragging a scroll bar, pulling down as the list flies up, but the browser has touch and drag scrolling. Nothing's too frustrating or unreasonable, but this is no seamless experience. The phone will be marketed under Nokia's "Live" banner, and really concentrates on the most basic communications -- calling and texting -- with a whole bunch of multimedia piled on top. Nokia's Comes With Music helps on that end of things, and the screen certainly helps with video, but this is no iPhone when it comes to to solid media integration or full-featured media player apps. On the communication side, we're sad to see Nokia almost burying some of its S60 advantages. Everything's still there, but Nokia didn't put the gruntwork in necessary to really take advantage a next-gen interface as it relates to keeping track of emails, social networking, IM and the correspondences of more than four people. All that said, Nokia isn't claiming that the 5800 is the be all end all, is releasing it with a very aggressive price point (€279 unlocked), and promises more where this came from. hey ur blogspot is jst too gud.. heaven for mobile freaks..a lot to explore...keep updatin!! I really like your post, thanks for share!